The use of a digital avatar of a physical product has become one of the hottest new technologies, thanks to the growth of the Internet of Things (IoT) and its ability to gather and upload real-time data about the physical world and apply it to the digital “twin”. The software vendors who were quick to offer services and products in this space were product lifecycle management suppliers such as Siemens and computer-aided engineering (CAE) specialists in simulation, notably Ansys and PTC. The need to provide a similar solution to companies in the AEC (architecture, engineering and construction) space, as well as the biggest built environment, the city, brought another set of vendors on-stream, the CAD and BIM software brands, and the GIS companies. The primary focus of those in AEC and city planners starts with location. This is why companies such as ESRI have invested a lot of money into providing a digital twin platform, while CAD and CAM companies Autodesk and Bentley have enhanced their 3D CAD applications to provide digital models of buildings, neighbourhoods and entire municipalities. These can be used during concept and design phases to study the impact of the new building on its surrounds. Once built, sensors in the physical building can monitor it for maintenance and liveability issues, such as water leaks and ambient temperature, and relay this information back to its digital sibling. The benefits of building a 3D digital scale model of all or part of a city are obvious, especially when sensors and other devices like CCTV have been placed at strategic points to measure everything of relevance to running a well-maintained urban environment. The simple act of implementing a sensor in municipal waste bins to send a message when they need to be emptied both saves money and improves waste management in cities like Barcelona. One of the earlier vendors providing software for cityscapes is CityZenith, which originally had the rather eccentric name of Screampoint. When they first launched, here were many sceptics, but the explosion of the IoT has changed attitudes. Their Smart World platform is already being used for projects in over 100 cities including Chicago and London. Their latest software platform, 5D Smart City, has been adopted for use in developing Amaravati in India. 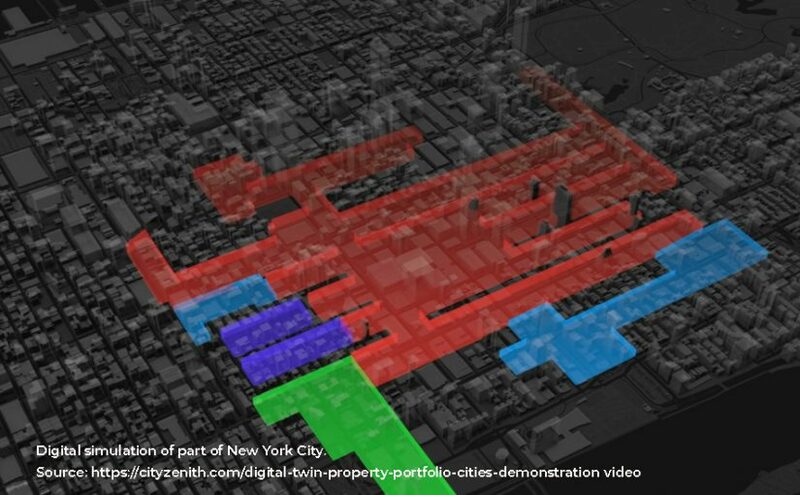 This is an ideal digital twin concept because the physical city has yet to be developed. Long before the concept of smart city platforms, cities were using GIS to represent and understand their environment and ecosystems. Companies such as ESRI have been assisting cities in mapping for decades; they are now uniquely positioned to take them further. In an article written for Banque Paribas, David Jonglez, Business Development Director for ESRI France, discusses how mid-sized cities are in the forefront when it comes to digital twins, and mentions the coastal and port cities of Cannes, Le Havre and Brest. However, Paris, despite its size, is embarking on a digital twin initiative, which is planned to take up to 2024, but will already have a prototype in place in the next few months. Autodesk has teamed up with ESRI to ensure that their BIM software integrates with ESRI’s ArcGIS to assist cities in merging the past and future built environment with the geographical layout, accelerating the formation of a digital twin. One of the chief exponents of digital twinning is Dassault, who teamed up with Singapore to create “Virtual Singapore”. Prior to that, in 2013, they acquired a 3D GIS modelling company in Rennes, called Archivideo, and using the GIS software combined with their own PLM lifecycle management software to provide the platform for a digital city, using Rennes as their proof of concept for “3DExperiencity”, their digital twin platform. Their Geovia produuct, while i can be used for a variety of industries, such as mining, has been designed to help capture the digital identity of the city. Dassault claims that Geovia helps break down the data silos within municipal IT, thus assisting city planners and engineers to predict and simulate events and plan mitigations against their occurrence. Microsoft has gradually been extending its capabilities in the world of IoT, using Azure as the platform for IoT management. It now has taken this a stage further with its Azure Digital Twins product, released recently. Cities can now pick and choose from their favourite vendor when looking for a digital twin platform, often partnering with the vendor to refine the product to suit their needs. Digital twins is a rapidly growing market, it is expected to grow globally by almost 38 percent annually, reaching $15.7 billion by 2023, according to MarketsandMarkets research. A few of the cities that have already built, or are in the process of building twins are mentioned below. While Singapore is classified as a Smart City, it is actually a Smart Island. One of the benefits of being a smart island is that the perimeters of your twins are clearly determined by the sea. This $70-million plus digital sibling has been developed by Singapore, in collaboration with Dassault to produce a central platform where all the disparate modelling done by different government agencies has a common home and a common look and feel. In order to feed the digital twin, Singapore needs pervasive IoT to feed Virtual Singapore and has put a number of initiatives in place, notably a SigFox network that covers 95% of the island. The main stumbling block when it comes to IoT is that there is no common protocol and each supplier has their own approach. Vivian Balakrishnan, Minister of Foreign Affairs and Minister-in-charge of the Smart Nation Programme Office, describes this as “walled gardens”. “Every big IT company wants to create behind its own wall a unique ecosystem, and is trying to lock us in” – a sentiment probably shared by everyone who depends on software of any sort to conduct their business. Under his oversight, Singapore continues to push for an open standard and has published four standards to date for IoT required for the island state. Modelling their city is not a new concept in Boston; in the 1980s the Boston Planning & Development Agency (BPDA) built their first model in wood. Today, with the assistance of ESRI, they have crafted a digital model. Its primary focus is on shadows caused by new developments on Boston Common, the oldest park in the US and beloved by Boston’s citizenry. There is actually a law governing how much shade can be cast by buildings and the twin helps decide positioning and the number of stories of any new building. By the way, the wooden model still exists and is still in use. Impressed by Singapore’s virtual city, Jaipur have embarked on their own digital twin initiative. Jaipur was one of the cities who did not permit Google to map their city, citing security constraints, and have come up with their own method of capturing data for their model by using LiDAR backpacks. Seeing how successful the collaboration was between Singapore and Dassault, they also opted to go with the French engineering software giant. The intent is to help with city planning; the only roadblocks are Indian bureaucracy, which tend to slow things up. For instance, flyovers to assist in mapping experienced several months delay waiting for approval. Both China and India have a huge population problem. In order to keep up with the expected growth, China requires 200 new cities and India estimates that they will need 100 new cities. Although India’s new city initiative is being hampered by red tape, Amaravati is the hope for the future. Currently a rural district and home to a pilgrimage site, the new city is envisaged to be the smartest of cities, and will be built from the digital twin, which will be the first-born. This is a very rational way to approach new city development and the outcomes are keenly anticipated. How many years it will take to achieve the dream are very uncertain at this stage. Cityzenith will assist in the mapping. 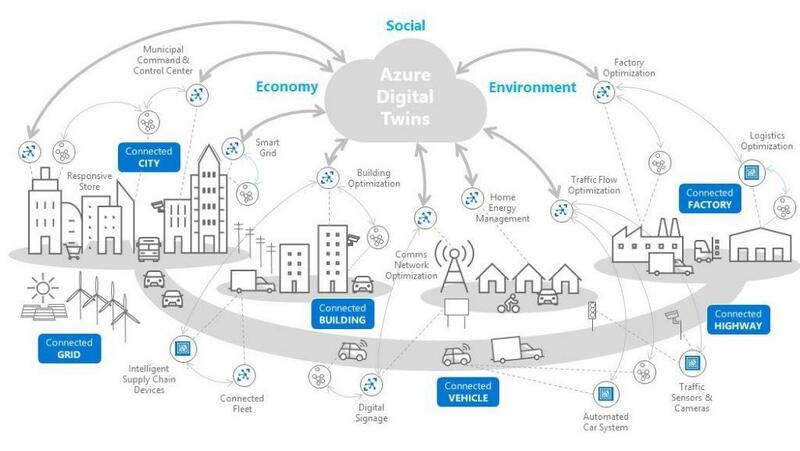 Just as manufacturers are leveraging digital twins for better outcomes in specific areas of product development, the digital twin for a city need not be a complete clone of the physical city; it can just be a digital manifestation of an aspect of city life. The city of Newcastle in England is building a digital twin for predictive risk management. An event in 2012, called the “Toon Monsoon”, where a freak rainstorm overwhelmed the city’s drainage system and cost millions of pounds of damage, was the spur for building a digital city for predicting and mitigating such risks in the future. It is predicted that risk management will be the major focus of cities when adopting digital twins, as climate change is creating new challenges and risks globally. As the market matures, it is possible that we will see the rise of more siblings, where some cities will have digital quintuplets or more, each of which communicates and interacts with the physical twin and each other, but focuses on a particular problem.